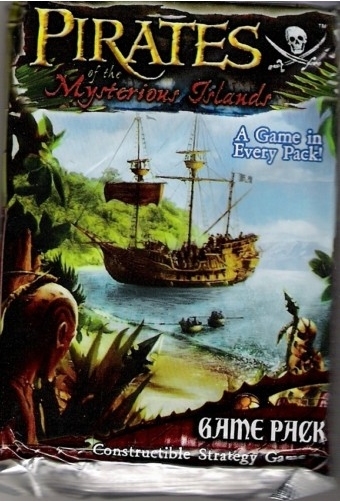 Find the Mysterious Islands on eBay! 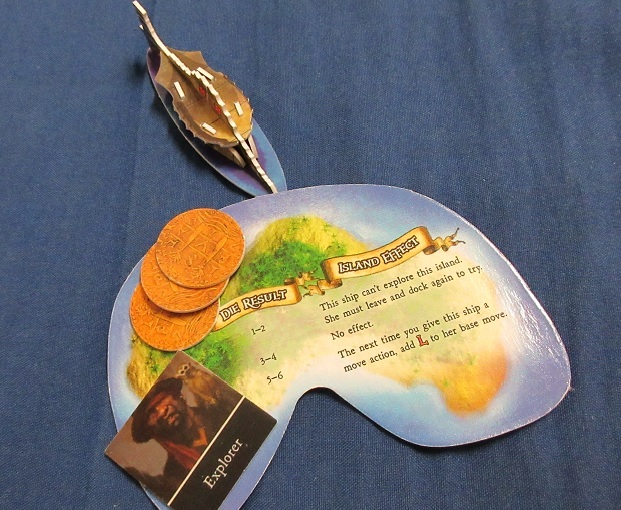 Pirates of the Mysterious Islands (MI, 2006) featured the new Mercenary faction and introduced Submarines. Honestly it was not a great set, as the artwork seemed dull and the ships were worse than the ones from DJC. In addition, the Mercenaries are the worst of the minor factions since they cannot dock at their own home island! However, you’ll enjoy the set if you like subs and the tie-ins to Jules Verne’s 20,000 Leagues Under the Sea. You can find all of the game pieces in the Master Spreadsheet, and I’ve ranked the Top 10 here. – Set Quality: 3/5. The Mercenaries introduce an interesting dynamic to the game, and some of their game pieces have affected fleet-building ever since. Each faction got some solid if unspectacular ships, but plenty of mediocre/boring ships were introduced as well. – Collectability/Misc: 2/5. Not entirely collectible, between the low playability and lackluster PR’s (with the exception of the MiaB pack). The miscellaneous score has to suffer as well – this set can be rather boring and hasn’t stood the test of time that well for me. It doesn’t help that this set came out at a bad time – soon after the general brilliance of the “golden age” and when DJC (a superior set) and its sales likely set expectations too high. In addition, I noticed that the ships are generally more brittle than usual, which is especially bad for newer players. = Overall: 10/20. As godmason said, bad execution. Perhaps more playtesting could have improved the new mechanics. Below you can check out the entire Set Review Podcast episode for a full overview of all the game pieces. Posted in Informational, Reviews and tagged Informational, Sets, Useful.